← How Do We Feel About Splitting “The Hobbit” Into THREE Movies? Well, now that The Hunger Games is out on DVD I guess it’s about time I post my thoughts on the movie adaptation of Suzanne Collins’ brilliant book. For the most part, I thought it was fantastic. They got a lot of things just exactly right, (Caesar Flickerman, anyone? ), and I loved that we got to see things outside of Katniss p.o.v., like the Gamemakers and President Snow. 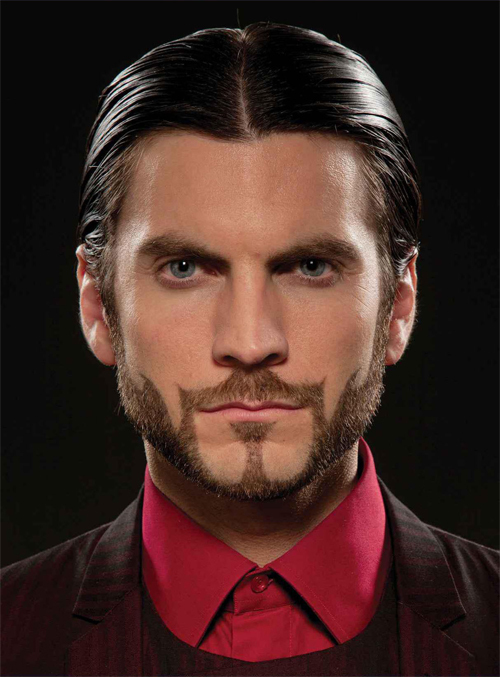 I mean, the characterization of Seneca Crane was one of my favorite things about the movie, which I never would have predicted from just reading the book. I didn’t mind any of the narrative changes that were made between book and movie, because they all served to tell the story better in the visual format. Cutting out Madge and making the mockingjay pin a re-gift from Prim to Katniss instead was a wonderful decision for the movie. Movies just don’t have time for all the details in a book, (which is why I would say this movie is a great companion to the book, and I wouldn’t recommend it on it’s own. I mean it’s a great movie, but people should both watch the movie and read the book. The book is Katniss’ story, but the movie is able to show the bigger picture, the national conflict that her story takes place within.) Anyway, there isn’t much time at the beginning of the film to establish the character dynamics between Katniss and Prim, incredibly important because saving Prim is Katniss’ entire motivation for volunteering. (A scene, by the way, which makes me cry every time I read it, see it in the trailer, or the movie. Self-sacrifice!) Everything they showed in District 12 was excellent exposition. 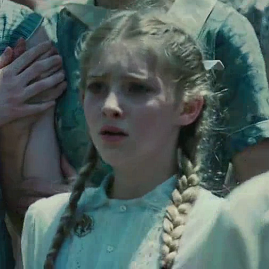 The added detail about a finger prick being part of the reaping registration was genius, because it showed why the thought of Prim going to the Hunger Games is so horrific–girl can’t even shed a drop of blood from her finger without crying. I know a lot of book fans hated the decision to cut out Katniss’ receiving a gift of bread from District 11 after Rue’s death, and replace it with scenes of a District 11 riot, but I actually really liked it. It shows that Katniss inspires people to rebel against the Capital that they already hate, which is what happens in the books! It’s just that in the books, Katniss has no idea there are rebellions until Catching Fire, and she doesn’t really realize what a powerful symbol to the revolution she herself is until halfway through Mockingjay. The riot scene in the Hunger Games movie shows an immediate response in the Districts to Katniss’ actions in the Arena, and for all we know there were minor riots during the Games. That scene also demonstrates that the Capital is still powerful enough to shut down these rebellions immediately, violently, decisively. It fits well with President snow’s lecture to Seneca Crane on the manipulative nature of the Games, “A little hope is fine, but a lot of hope can be dangerous. Contain it.” Soldiers and hoses is how the Capital contains an outbreak of too much “hope.” And then, after that riot scene, the movie cuts back to Katniss sobbing in the Arena feeling utterly abandoned and alone, with absolutely no idea that so many people are behind her on the outside. It’s great storytelling and totally in line with the direction the book is going. Almost all of my movie criticisms were trivial; (I don’t like the shaky cam, Jennifer Lawrence really can’t sing very well, why couldn’t they get an orange cat for Buttercup, or a decent wig for Haymitch? ), but the biggest flaw in the movie involved one of the most important characters–Peeta. Oh, Peeta. Easily my favorite character in the book, yet unfortunately the biggest disappointment in the movie. And I don’t think it’s Josh Hutcherson’s fault, even though I wasn’t sure about his casting before I saw the film. If you watch Hutcherson in interviews, he’s lovably adorable and very Peeta-esque. It’s the script. And it’s a shame, because almost every single movie-Peeta scene is excellent. It’s just, the ones that were bad were crucial to his character, and now I’m afraid Movie-Peeta might have been ruined for the rest of the series. When he’s waving and smiling at the Capital crowd from the train. Peeta grabbing Katniss-on-Fire’s hand and saying, “Come on, they’ll love it!”, helping her gain favor with the crowd and potential sponsors. Knowing just how to play the audience and selflessly benefiting her. Peeta’s interview with Ceasar. Come on. It’s golden. Peeta on the rooftop, the night before the Games. Exactly right, just what Book-Peeta would have said, (and in fact very close to what he did say). Peeta yelling at Katniss for her to “get out of here, go!” after the tracker jacker incident. Flashback Peeta throwing Katniss the bread, and cave-Peeta saying “I think about that all the time, how I tossed you that bread. I should have gone to you, I should have gone out in the rain…” beating himself up because his act of mercy wasn’t chivalrous enough! So great. Peeta tapping Cato’s hand, signaling for Katniss to shoot him there, and Peeta pushing Cato off the cornucopia. Peeta on the train home saying that he doesn’t want to forget. That’s a lot of great Movie-Peeta moments! But…remember what I said earlier about Katniss self-sacrifice for Prim making me cry every time? It’s the same with book-Peeta; he may not be the most physically strong, he may not poses all the skills Katniss does, but his strength of character lies in his utter selflessness, his devotion to Katniss’ well-being over his own. It is a strength, it is his greatest strength, (as Divergent‘s Four says in chapter 24, “it’s when you’re acting selflessly that you are at your bravest,”) but Movie-Peeta’s concern for Katniss is portrayed as a weakness and an obsession. Movie-Peeta plaintively asks Katniss, “why not?” when she says “I’m not gonna leave you. I’m not gonna do that.” Movie-Peeta says “I’m not gonna let you risk your life for me,” and “why are you doing this?” when Katniss plans to go get the medicine from the Feast. When she kisses him, he says, “Now there’s no way I’m letting you go. Please. Stay.” Later, when Katniss returns with the medicine, Movie-Peeta whines “What happened? You shouldn’t have gone, you said you weren’t gonna go!” Begging. Pleading. Plaintive. Whiney. Weak! Movie-Peeta is almost a damsel in distress that needs Katniss to rescue him. 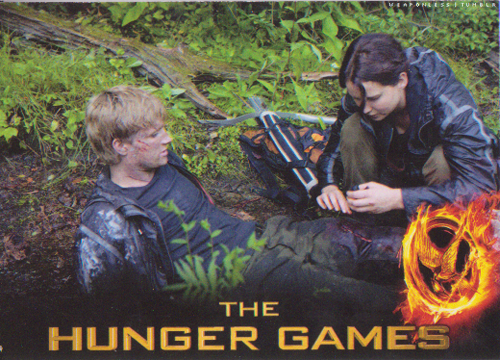 Book-Peeta may not have survived without Katniss’ help, but he wasn’t helpless. Book-Peeta does not beg. Book-Peeta maintains his wit and cracks jokes and flirts even as he lies dying in the cave. Let’s compare whiney, beg-y Movie-Peeta to Book-Peeta, when Katniss is trying to argue she should go for the medicine. “I can follow you. At least partway. I may not make it to the Cornicopia, but if I’m yelling your name, I bet someone can find me. And then I’ll be dead for sure,” he says. “You won’t get a hundred yards from here on that let,” I say. Book-Katniss literally has to knock Book-Peeta out with drugs to keep him in the cave while she goes for the medicine. But Movie-Peeta is all, “Oh please, don’t go, kiss me, now seriously don’t go,” then falls into regular sleep, and then whines “Aw, how come you went? !” when she gets back. 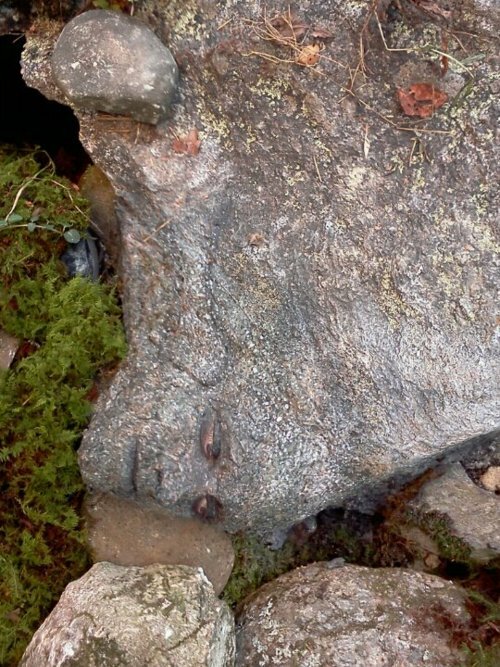 Book-Peeta’s argument is, “If you try to risk your life for me I will actively sabotage your efforts by sacrificing mine for you instead,” while Movie-Peeta’s argument is “Please don’t go, I might lay here and cry if you do.” Movie-Peeta in the cave scenes is by far the worst part of the movie, and the undermining of his entire character in the film. This gives me no joy to type. In fact it gives me a big ol’ frowny face. But there can be no other conclusion. Move-Peeta utterly fails to convey the strength of character of Book-Peeta. Movie makers, please, please improve upon this in the next movie! I would gladly take an ugly Finnick in exchange for a proper Peeta. I mean, when I read the books, I’m like, “Katniss, choose Peeta! Obviously he is the perfect choice and you’re totally in love with him, admit it!” But watching the movie, I’m like, “meh, I can see why she wouldn’t really fall for him.” The movie didn’t convey that she felt anything, that any moment was more than acting for the cameras for her. And why should it be, if Movie-Peeta is such a whiner? Okay, I think I’m done ranting. Oh my goodness. This was so great! Thank you for pin pointing why Peeta is not so hot in the movie. It’s stinks when I tell people “I love Peeta” and they’re like “no he’s so whiny.” Now I am armed with an argument against that and the perfect book references. HaHa! Wow..so great. I still really likes Peeta in the movie..but I already have book-Peeta in my brain. Book Peeta is amazing. I love the banter and sarcasm that Katniss and Peeta have in the book…and of course, the love. Watched the movie again last night. Decided I really like Josh as Peeta. I feel like he got everything right. I think if they write a better script for him, it will all come together. Decided I was disappointed though about the development of relationship between Katniss & Peeta. They gotta speed that up in my opinion. I think my favorite Peeta moment in Hunger Games though was the rooftop. Perfect. I saw the movie first and then i had to read the books. Notice that passed like 6 months betwen the movie and the DvD,. When i started reading the books I felt in love with Book-Peeta so i forgot the movie, when i actually saw it on august it was such a dissapointment. The Movie-Peeta its not like in the books, I compleatly agree with you and I really hope they use that funny thing that Josh Hutchersons has, otherwise im not going to like the movies, im going to watch it and thats it. There is this other thing, at the end when he grabs Movie-Katniss hand Movie-Peeta have this face of “she is mine and im demonstrating to you” and i hate it, the same in the chariot, Book-Peeta takes her hand because they told them to and she didnt hear it, but in the movie he seams pleading. And I HATED that she loose his hand at the end of the parade. I would love to say more but it would be like a lot longer than this, but I would love to read your opinion in the Catching Fire Movie. your English is fine! I didn’t mind the hand-holding scenes you mentioned, because I think they were both Peeta realizing the best way to present Katniss to the cameras and crowd. In the chariot scene in the movie, Peeta tells her, “come on, they’ll love it!” and it reminds me of when Haymitch warns Katniss on the train that Peeta “knows what he’s doin'” with the crowd. I don’t get the vibe at the end that Peeta is claiming Katniss over Gale so much as acting, once again, for the crowd and the cameras. She just told him that she wanted to forget and pretend their supposed love story never happened right before, so i don’t think he’s under any illusions about their relationship. It’s pretty close to the end of the book when he says, “one more time? for the audience?” But I do agree that I wish they had continued to hold hands at the end of the parade, and now that I think about it, having their hand-holding be Peeta’s idea instead of Cinna’s lessens the stylist’s contribution to Katniss image! and I will definitely write an analysis of the Catching Fire movie after it comes out! Well, I disagree entirely. Book Peeta is completely devoted to Katniss, but Movie Peeta brings the absolute love he has for Katniss to life. He is perfect. The whiny cave scene? One of my favourite scenes when he is wiping the medicince across her forehead. It is one of the most touching scenes. Josh is amazing as Peeta. I can’t imagine the movie without him. I loved your breakdown of Peeta here-I think you have got it spot on. I would only add one more golden Movie-Peeta moment. When they are counting down to eat the berries and he touches her braid as Katniss says “Two.” One of the most romantic gestures I’ve seen in awhile. I agreed completely with everything you said. Thank you for pin-pointing why peeta isn’t as good in the movie. I liked josh hutcherson and thought he was perfect for the role! But then I kept asking myself why he just didnt do for me what book peeta did. Thanks for thinking it through and sharing! Interesting read! I think I love Peeta (especially book Peeta) because he isn’t your average male hero. He’s the goid guy, and I have learned through real life that the good guy is always the way to go! Perfect! There are more things from the next movies that made movie peeta even worse tha n they made him look from the books but this is a good way to start that discussion! Thanks for this!